Event Description: The third largest city in the Bay Area (after San Jose and San Francisco), Oakland is the principal city in the East Bay and home to the famous Oakland A’s and Oakland Raiders sports franchises. 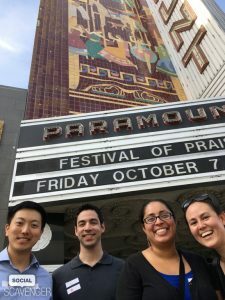 A perfect East Bay teambuilding venue, Downtown Oakland is a fascinating place to explore while working on your team unity. Location History: In the late 1860s, Oakland was selected as the western terminal of the Transcontinental Railroad. It continued to grow into the 20th century with its busy port, shipyards, and a thriving automobile industry. Following the 1906 San Francisco earthquake, many San Franciscans relocated to Oakland, enlarging the city’s population, increasing its housing stock and improving its infrastructure. A steady influx of immigrants during the 20th century, along with thousands of African-American war-industry workers who relocated from the Deep South during the 1940s, have made Oakland one of the most ethnically diverse major cities in the country. During your teambuilding treasure hunt… expect to encounter: the ornate Fox Theater of 1928; a crazy display of Barbie dolls; a mural dedicated to Alice in Wonderland; a museum about bleach, and much, much more.